If you liked my sunset photograph from last Wordless Wednesday, you're going to love the newest addition to my jewelry collection! Renae (aka Mademoiselle Mermaid) and I may have moved to opposite sides of the country after becoming fast friends at college, but we enjoy photographing similar subjects. When she offered to send me one of the new nature photo pendants she's selling on Etsy, I chose her Santa Monica Sunset necklace as a memento of the beautiful beaches I saw when visiting her in California. She has several flower photo necklaces that were tempting to pick, too! And one lucky reader can pluck one from her whimsical garden for free. Just travel to the Jewelry Giveaway I'm hosting for her and follow the Rafflecopter instructions to enter to win before April 5, 2015. That is so beautiful! What a lovely keepsake! Very cool idea with the jewelry! Have a great day! Love the stone in the necklace!! really lovely keepsake that you have. Very Beautiful indeed, could imagine wearing. It's so beautiful and creative!! Thats so beautiful! You just wear that and you would look fab! Very interesting piece. Wouldn't you like to watch the processes involved in creating this little gem? Gorgeous necklace! Very beautiful, it reminds me of summer! What a gorgeous sunset. And to have it locked into a necklace is even better! Such a lovely photo in a lovely pendant! 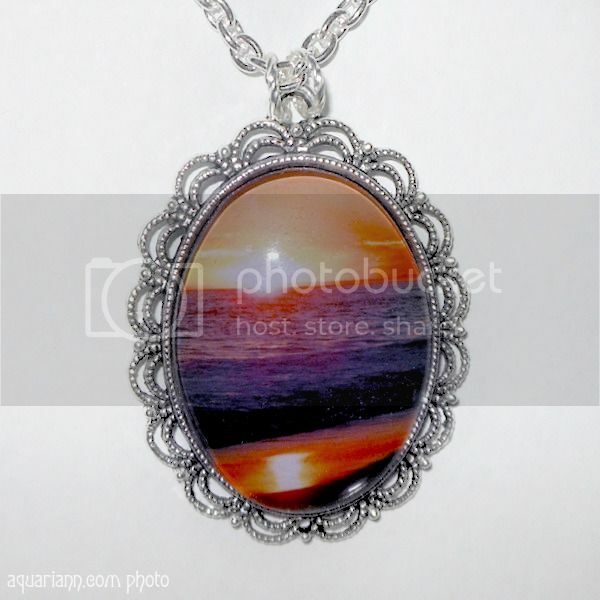 what a lovely pendant ...great sunset scene..